Even though we care about your pets, it doesn’t mean that we want to see them in need of our care. Here are some great safety tips on how to avoid our emergency room and keep your pets safe all year long. For more information on pet safety tips, please visit Veterinary Partners. It may seem like a car trip will cool off your pet, but it will probably do more harm than good. The sun can raise the temperature in the car to 120 degrees Fahrenheit within minutes. Whether you’re indoors or out, both you and your pet need access to lots of fresh water during the summer, so check water bowls several times a day to be sure it’s full. If you go outside, be sure to bring plenty of water for both of you. If they’re extra thirsty, pets are bound to drink something they shouldn’t drink. Puddles of what looks like water may be on the ground, but they may include antifreeze or other dangerous chemicals. Did you know that antifreeze has a sweet taste that animals like? But watch out. It can be toxic. Your pet can get sunburned, just like you! Especially if he or she has light colored hair. Animal sunburns can cause some of the same problems as with people: pain, peeling, and skin cancer. Keep your pet out of the sun between 10 a.m. and 4 p.m. When you do go outside, rub a bit of pet safe sunblock on unprotected areas like the tips of the ears, the skin around the lips, and the tip of the nose. Some sunblock can be dangerous to your pets. A rule of thumb: If it’s safe for babies, it’s safe for your pets. Don’t overdo it in the heat. Keep walks to a gentle pace. If your pet is panting a lot or seems exhausted, it’s time to stop. Even if they’re in the shade, animals can get sick quickly on hot days. Keep them inside as much as possible. If you have to leave them outside, check on them regularly. It can be fatal. If you suspect your pet has heatstroke, call a veterinarian immediately. In the meantime, lower the animal’s body temperature by applying towels soaked in cool water to the hairless areas of the body. Often the pet will respond after only a few minutes of cooling, only to falter again with his temperature soaring back up or falling to well below what is normal. With this in mind, remember that it is imperative to get the animal to a veterinarian immediately. A fur coat does not ensure warmth! Hypothermia and dehydration are the two most probable life-threatening conditions for animals in cold weather. Make sure your pet is indoors or in covered shelter, with plenty of food and water. Blankets or thick towels, even an old quilt will give your animal something to snuggle in against the cold. If you cannot bring your animal inside, check on him or her regularly. Animals drink less in cold weather, so it’s important to make sure your pet is getting hydrated. Be sure your pet’s water supply does not freeze. Very young and older animals need special attention during the cold. Their immune systems can’t handle the weather as well as other pets. Be aware that some chemicals used to melt snow are hazardous to your pet! Keep a close eye on them when they’re outside, and be sure to clean off their feet when they come back inside. That way, they won’t lick their feet and ingest any toxic residue. Call your vet immediately with any health concerns. Provide plenty of water. An average, healthy, resting 100 lb. dog requires about 3 liters a day. That may double if he’s exercising. Ocean water is not recommended. Keep an eye on your dog. Is he showing signs of heat exhaustion? They are: excessive panting, difficulty breathing, lack of urination, brick red gums, staggering, vomiting, or diarrhea. If you are nowhere near help, immerse your pet in cool water and rest in a shady area. Don’t share pain medication with your pet. Anti-inflammatory drugs like acetaminophen, ibuprofen, or aspirin can have toxic effects on their livers, gastrointestinal systems, and kidneys. Anything with mold growing on it. While there are advocates of raw food diets for pets, there can also be dangers associated with it. Chicken can be especially dangerous. It is a major carrier of Salmonella bacteria. How do you know if your animal has been infected with salmonella? Many animals can be infected with Salmonella but show no signs at all. That presents a real risk to humans especially young children who may handle infected pets. Basic hygiene is important to prevent the spread of the bacteria, especially after playing with animals, cleaning out their environments or handling their food and water bowls. Hands should be washed thoroughly. Paraquat is one of the most widely used herbicides in the world. It is quick-acting, non-selective, and kills green plant tissue on contact. Animals often vomit quite soon after ingesting the paraquat-containing food. Sometimes they will vomit up pieces of the food that the poison was hidden in. Occasionally they’ll vomit multiple times. Often, animals will seem to feel better after the initial vomiting, but others will continue to vomit. Usually, within a couple of days, the vomiting will start up again, and the animals will become lethargic. They will usually stop eating. If very large quantities are ingested, they may progress more quickly through the symptoms and show signs of respiratory distress or death. 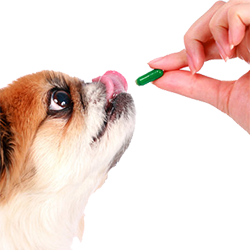 he ones containing metaldehyde are toxic to pets. They are cheap, abundant, and well advertised, but they seriously affect your pet’s central nervous system. They can cause tremors, drooling, restlessness and often proceed to seizures and death if not treated. The most popular chemicals used to control rodent populations have been “anticoagulants.” These cause the body to lose its ability to clot normally, and in three to five days, a rodent will die of internal bleeding. Currently, one of the most popular baits on the market is bromethalin. Animals who ingest a substantial quantity of this bait can have tremors, running fits, seizures, and death within the first few hours. Smaller amounts may cause weakness and wobbliness that progress to paralysis and coma. Bromethalin is often green and in a block or pellets like many anticoagulants. If you can’t use non-toxic alternatives, always use a tamper-proof bait station. For the best possible results, consult with or utilize a professional who is knowledgeable about proper baiting techniques, equipment, and current products on the market and who is accustomed to treating homes with pets and children. With so many people and pets enjoying limited spaces, it’s important to keep control of them, either by leash or command. Keep a close eye on your dogs, and keep them within view at all times. Sniffing is an acceptable activity, but don’t allow them to eat or drink anything in a public area. Explosions are extremely frightening for house pets. Keep pets inside in a quiet, dark area with limited access to windows or other potential hazards. A radio or fan can provide soothing background noise to drown out the sound of fireworks outside. 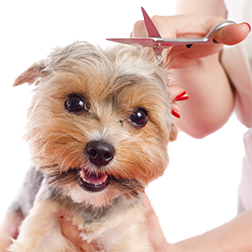 If you know that your pet’s nerves become extremely frazzled during this holiday, contact your veterinarian ahead of time to see if he or she recommends sedating them. Make sure your pets have proper identification in the form of ID tags or microchips, so if they escape, you can be quickly contacted when they are found. Fireworks in shiny packages can look like an appetizing snack and, if eaten, can be poisonous to animals. And although the risk is usually small, animals can be burned from falling fireworks and sparklers. 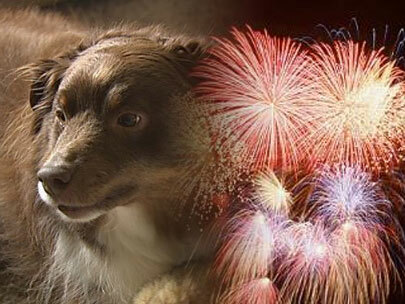 Keep both used and unused fireworks away from pets. It may be tempting to allow pets to snack alongside you at your 4th of July picnic, but “holiday food” can wreak havoc on a dog’s system. Keep fatty, sugary foods and alcoholic drinks away from prying noses. Keep candles away from tails and toes. Keep decorative light strands away from curious puppies and kitties. One chewing session can be dangerous and possibly deadly. Keep your pets locked indoors and away from trick-or-treaters. Dogs especially may feel that their territory is being invaded by the constant onslaught of visitors. Keeping your dog in a secluded area of the house will help him stay calm and keep him from growling or possibly biting your visiting ghouls and goblins. It will also keep your pet from being able to dart outdoors. Don’t take your dog along trick or treating. Even typically calm dogs may get spooked by excited, shrill voices and strange costumes. Make sure your dog has current, accurate & readable identification tags. If you have recently changed your address or phone number, update the ID immediately. If you haven’t yet, take this opportunity to have your pet micro-chipped with a Home Again chip or an AVID chip. Your vet can help you with this easy, painless procedure. If you have a black cat, be especially careful about keeping it indoors on Halloween. Some people are superstitious about black cats and may try to scare or harm them. An animal in a costume should NEVER be left alone and unsupervised. Some pets, if left alone in costume, may chew it up and ingest it. This could cause intestinal obstruction. If the costumed pet escapes or is frightened away, the costume could get caught on trees, fences, or bushes, and your pet could get hurt. Thanksgiving weekend is always a busy time for doctors at Town & Country Veterinary Clinic. Often, animals get sick because of distracted or careless pet owners on Thanksgiving Day and the days that follow. Most of the problems are gastrointestinal and can be prevented. Add a teaspoon of white turkey meat or broth to your pet’s food to share the “Thanksgiving experience” with your animal. Treat pets to goodies and gifts made especially for them. Spoil them with an extra hour of brushing or a quiet walk; both of you will appreciate the reprieve from noise and relatives! Shiny tantalizing strings of tinsel are enticing to cats, and they often pull the silver stuff off the tree by the mouthful. Once ingested, it can become entangled in the cat’s intestines and can create a life threatening obstruction. It is best to avoid tinsel altogether if you have pets in your house. Mistletoe is a small evergreen plant with white berries that is traditionally hung around the house in hopes of inducing festive “smooching”. All parts of the plant are toxic and as few as three berries can be lethal to a child. It is best not to have mistletoe in a home with pets or children. If it is a “must have” item for holiday tradition, find a plastic replica or seal the living plant in plastic and tack it firmly in place. Remove it as soon as possible when its desired purpose has been achieved. With more and more of our Christmas ornamentation needing to be “plugged in”, electrical cords are in abundance this time of year. Be careful to keep pets, especially puppies and kittens, from chewing on cords. Limit the length of cords, pets’ access to them, and inspect the cords frequently for any signs of fraying. Keep chocolate away from dogs. Dogs possess a fondness for chocolate; unfortunately, it contains a stimulant harmful to them (in addition to being loaded with fat and sugar). Keep chocolate in cupboards or sealed containers and off shelves, countertops, and coffee tables. Also beware of suspiciously good-smelling wrapped packages under the tree—no thoughtful friend or family member minds being asked if it’s chocolate when it’s for the safety of the family pet.